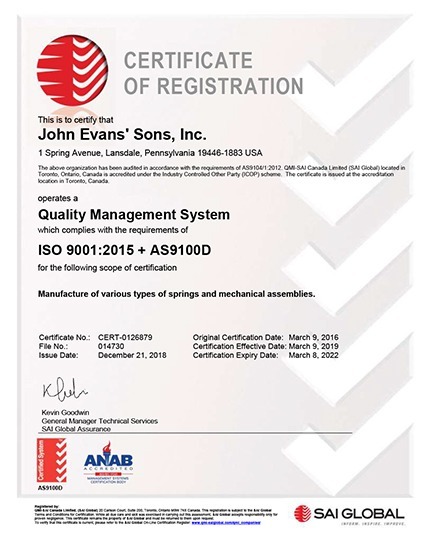 John Evans is certified to ISO Quality Management systems: ISO 9001, ISO 13485 & AS9100. Please see those certs. as well as other affiliations below. 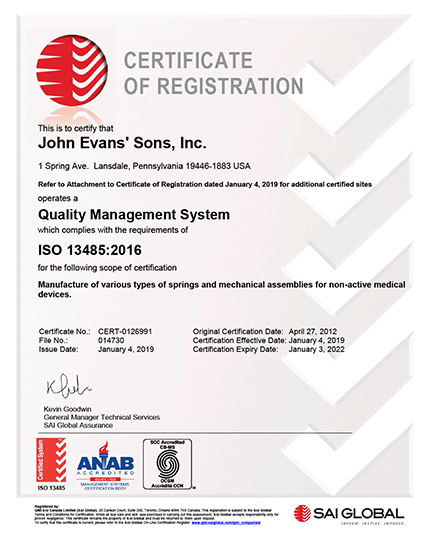 John Evans' Sons, Inc. manufactures a variety of precision springs, wireforms and spring assemblies. We are dedicated to fully understanding and exceeding customer expectations through teamwork and the ongoing pursuit of technical and manufacturing excellence. We are committed to satisfying the requirements of, maintaining the effectiveness of, and continually improving our quality management system, which is based on the principals of ISO 9001, AS9100, and ISO 13485. 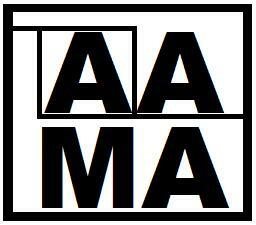 John Evans' Sons, Inc. is a member of the American Architectural Manufacturers Association. Our constant force balance springs including the SideLoad™ and Drop-In Series are AAMA qualified. John Evans' Sons, Inc. is a member of the National Business Aviation Association (NBAA) The leading organization for companies that rely on general aviation aircraft to help make their businesses more efficient, productive and successful.. Our constant force balance springs are widely used in aerospace applications. 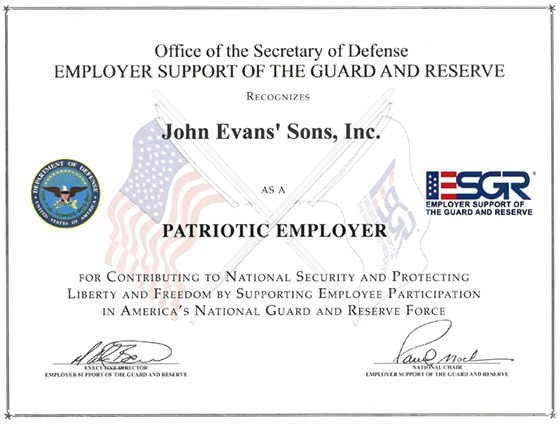 John Evans' Sons, Inc. is a member of the Spring Manufacturers Insitute (SMI) They serve, support and educate North American precision spring manufacturers in their pursuit of competitiveness in global markets. 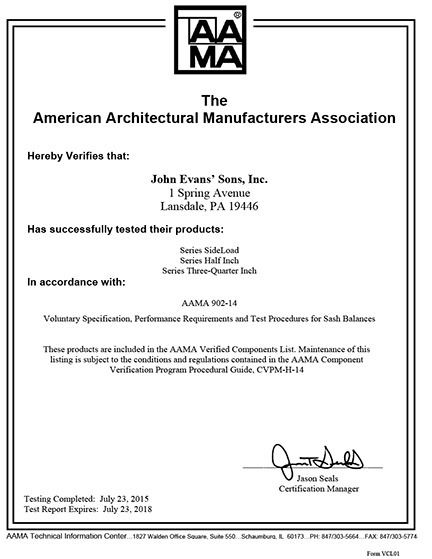 We are: American Architectural Manufacturers Association (AAMA) Qualified, ISO 9001, AS9100 and ISO 13485 Certified. Members of the National Business Aviation Association (NBAA), and the Northeast Window & Door Association (NWDA).